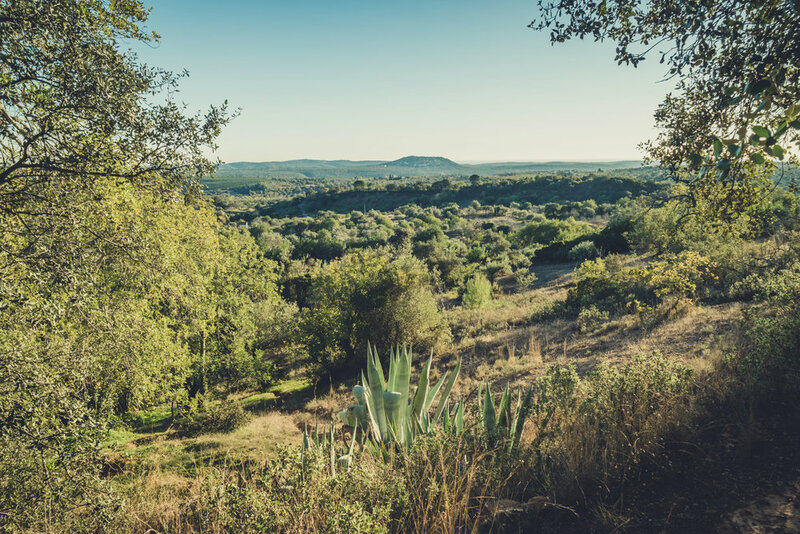 We were set on finding some nice walks and hikes while in the Algarve as it’s something we always look for no matter where the wind takes us. Not that we’re super fit - far from it! We just love the outdoors and exploring on foot. We’ve started to use an app (wikiloc.com) to discover local trails and it’s become a great resource for us to stay active on all our trips. After we found the trail for Rocha da Pena and saw the photos we were sold! We packed a picnic and plenty of water and sunscreen as it was a hot day, even in December. Our reliable rental car, Clem, was happy to be heading out on another adventure with us in the Algarve! After the highway towards Loulé we soon found ourselves on twisting rural roads through pretty white-washed villages and quiet farms. We reached Bar das Grutas, where the trail begins, and got our hiking boots on. If you are looking for the trail head it’s very easy to find. Just head for the bar on Google Maps (it’s down a dusty back road so don’t be discouraged) and you’ll find the signpost that marks the start. The bar itself is a great little spot for a snack and to stock up on water if you haven’t any (or a beer at the end of your hike!). It’s a steep climb at the beginning and it can seem a little daunting looking up at the towering limestone cliffs that stand out against the skyline. We took it really slowly and there were plenty of excuses to stop for photos! We spotted some rock climbers that looked tiny against the sheer silver walls of the mountain and didn’t envy them - we’re not great with heights! Along the well-marked trail (just follow the little red and yellow stripes painted onto wooden posts) we caught sight of beautiful birds, a couple of eagles and the wild lavender was everywhere. Every time we go walking I always say “I wish I knew what that flower/berry/tree is” and sure enough this walk had plenty of wonderful wildflowers to try and identify. In the spring and summer, this place is apparently full of orchids so we’ll just have to go back to see that next year! It took us a good 2 hours to reach the plateau and from there it was an easy walk along the top with stunning panoramic views. There are information posts to tell you about the local wildlife to watch out for and there’s an interesting read about the ancient stone walls that you come across on the trail. They were old fortifications dating back to the iron age and used again by the retreating Moors during the Crusades. We stopped here for our picnic of bread, cheese and local oranges while soaking in the sights and sounds and imagining epic battles. At its highest point, you can (carefully) climb onto the beacon for a daredevil photo or two and this is where you really feel like you’re on top of the world. The rolling hills spreading towards Spain are a sight to behold and you can catch the glimmer of the Atlantic Ocean to the West. It would be an epic spot for the sunset. Alas, we couldn’t linger as we had no torch and we knew it would probably take us over an hour to get back down to the car. Having said that, the walk down is easy and very pretty, so it was worth seeing it during the golden hour before sunset. The trail takes you back to the main road through the unbelievably cute little village of Penina, past old wells and orange groves. Crumbling traditional farmhouses with chickens in the yard, tiny cobbled lanes and friendly locals sitting outside the village bar, takes you back to what it must have been like fifty years ago. If you enjoy some fine walking and find yourself in this part of the world, we would absolutely recommend this trail to you. If you are fitter than us (which wouldn’t be hard) and took it at a pace, it wouldn't take you more than an hour or so to complete. Well worth your time and effort, it is really beautiful! Just remember to bring sunscreen and plenty of water as the landscape can be very dry and hot. Neil’s bald head shone like the light of Eärendil's star in the sun so his bandana of bewilderment was to hand at all times!